Akshaya lottery is part of the Kerala State lotteries and is one of the seven weekly lotteries launched by the government. The government also has 6 different bumper lotteries to go buy along with it. Kerala as a state has been the standard for other states in managing the lottery business. They themselves launched the lottery program in 1967 and became the first ever state to do so. 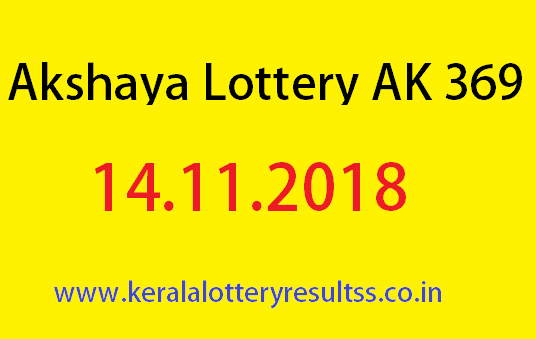 Akshaya lottery result is announced every Wednesday and has been running for over 368 weeks with the result for the week 369 to be announced today 14.11.2018. The lottery ticket costs Rs 30 for each and costs Rs 750 if you want to buy the whole book. The top grabbing prize for akshaya AK 369 is marked at Rs 60 lacks IC. the Akshaya Ak 369 lottery result will be announced at shree chithra home auditorium using lottery machine. The result for the Akshaya Lottery AK 369 will be announced on at 3 pm on the designated day, i.e. Wednesday. There are total of 108 lakhs ticket on sale for this. We will list the detailed prize structure of Akshaya Lottery down below. The results are announced via a lottery machine at an auditorium. They also post the results on website within an hour of it. Any winners of the lottery needs to contact the authority with the ticket within 30 days and should surrender it along with details to claim the prize. The prize claiming procedure also varies according to the amount with bigger amount requiring people to reach out to the office of Directorate of Kerala State Lotteries with the winning ticket.